The Hunter Valley Electric Vehicle Festival (the EV Fest) uses electric vehicles as a platform for engaging audiences in a range of fun and informative science, technology, engineering and mathematics based activities. The event is designed to display the value of science literacy, research, and innovation in building an informed community and vibrant future that responds to global challenges. At the heart of the EV Fest is a competition where the community, industry, high school, TAFE, and University teams are challenged to design and build an electric vehicle from scratch and come together to race them on a public race day at the Newcastle Kart Club Raceway. Different classes allow for a variety of vehicles to vie for the called the EV Prize, from modified low cost electric bicycles to high performance motorcycles and open wheeler cars. The EV Prize race day has grown rapidly over the last three years from 8 teams entered in 2011 to 50 teams in 2013, becoming the world’s largest electric motorcycle race event attracting the highest number of competitors. The Schools Cup is the largest class in the competition, with 34 teams from 24 Hunter High Schools entering in 2013. By placing high school teams alongside TAFE, university, industry and professional electric motorcycling teams in the pit area, we have created an EV community that provides opportunities for skills development and career pathways in these emerging electric vehicle and sustainability technologies. There is a strong participatory element to the science communication activities of the EV Fest as a result of its ‘free, design, build and compete’ format. This encourages members of the public to become involved both as spectators and through their connections to participating team members. In 2014 the EV Fest will become a high profile weekend event (16-17 August) combining the EV Prize competition race day with an electric vehicle expo that will includes exhibitions, demonstrations, workshops, ‘come and try activities’ and entertainment. The National Science Week Cup and Power Source EVolution will be central events within the program. 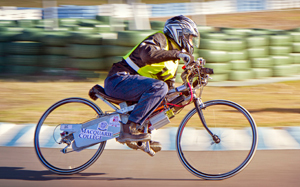 The National Science Week Cup was first run in 2013 and is an endurance race, within the open single seat division of the EV Prize, for moped scale prototype electric motorcycles with a capped battery limit. It challenges teams to build an innovative prototype motorcycle and then work out the most efficient race strategy for the tight and twisty kart racing circuit. In 2013 the National Science Week Cup drew competitors from as far afield as Perth. The new Power Source EVolution award will challenge teams competing in any of the racing or demonstration events within EV Fest 2014, to design and build a prototype portable zero emissions power source for recharging their electric vehicle. This will allow EV Fest 2014 to engage with the broader societal challenges of energy and environmental security. The continued growth and success of the EV Fest is based on collaborative and supportive relationships between industry, research, the community, local and state government and educational institutions. Early indications are that EV Fest 2014 will be the biggest yet. Entries are free and open to all. Registrations for race and stall participation will open in February 2014. The Hunter Valley EV Fest was initiated in 2011 by the Tom Farrell Institute for the Environment at the University of Newcastle.